We both love Lambics, in fact while we were visiting Belgium a few of years ago we drank a huge variety of them. Aside from the fact that they were so good, we felt that we had to imbibe as there were many Lambics that we simply couldn’t buy anywhere else. Certainly not in Texas, where the TABC run the show with their bizarre regulations which seem to favour only the giant breweries. Because of the TABC and its weird quirks, some of the more esoteric lambics (and particularly Schaerbeekse Kriek) can be difficult to find. Lambics are beers made with spontaneous fermentation, rather than by the addition of yeast they use yeasts occurring naturally in the air, the most common being Brettanomyces bruxellensis. They are so called Sour Beers, which can be an acquired taste, but one definitely worth acquiring! To quote Michael Jackson (The beer expert, not the inventor of Jesus Juice): “The lambic family are not everybody’s glass of beer, but no one with a keen interest in alcoholic drink would find them anything less than fascinating. In their ‘wildness’ and unpredictability, these are exciting brews. At their best, they are the meeting point between beer and wine. At their worst, they offer a taste of history” (From The Great Beers of Belgium, 1991). I personally had my lambic epiphany with Oude Lambiek, by Geuze Stekerij De Cam. We could only find it in ‘t Brugse Beertje in Brugge at the time, so had to go there more than once, just for one more, I promise, no really. Lambics can be made more accessible by adding fruit, no fruit more iconic than the Belgian Kriek which is a type of cherry. One of the beers we particularly enjoyed in this vein, was an aged kriek lambic by the Drie Fonteinen Brouwerij (Three Fountains Brewery). The Oude Kriek leaps out at you as an excellent, very fruity lambic. Not surprisingly it gets 5 out of 5 stars in CAMRA’s Good Beer Guide – Belgium, so you can imagine how pleased I was when Angela arrived back from her trip to Portland with 2 large boxes of beer, one of which contained a Drie Fonteinen Oude Kriek. Or so we thought. On closer inspection it turned out to be a rather special “Schaerbeekse Kriek” bottled on 28th April 2010. It also turns out that these particular cherries are quite rare, grown only in a small area of Belgium. 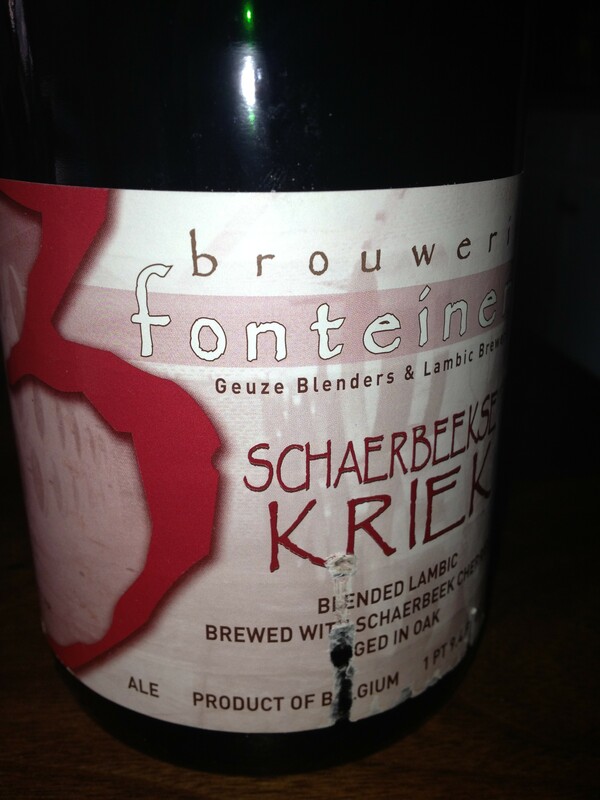 In fact in 2009, Drie Fonteinen only produced 6000 bottles due to the scarcity of the cherries. The cherry is a wild variety, growing close to the brewery, but the trees are disappearing. This, plus the fact that the brewery relies on its neighbours to provide them with the cherries, results in very limited production runs. In general, its is becoming harder to source kriek cherries, which is why some brewers are looking further afield for them, some as far as Poland. These cherries, while excellent for Lambics, cannot bear the name “Schaerbeekse”, because they are not from Schaerbeek, however, the good news is that Brouwerij Boon, has plans to plant an orchard of these wild, tart cherries, with hopefully more breweries following suit. Perhaps soon we may see a revival of beers using this unique cherry. On the nose, the first thing that hit me is a very dry champagne note, followed by sour cherry with a nice lambic funk. The beer itself is very sour, somewhat mellowed by the almost 3 years of aging. The cherries add to the sourness, but bring with them a complexity that is magnificent. Shame we only had one bottle! Lambic’s pair well with shellfish and with rich, dark chocolates, but they also go surprisingly well with more robust dishes. If you’re feeling adventurous, try them with these Steen’s syrup braised-pork turnovers. I love rye. Rye bread, rye whiskey, and rye beer. We have an excellent rye beer made in Texas called Real Ale Full Moon Pale Rye which tends to be a standard go to for me. So I was excited to come across this in a grocery store in Portland, OR. 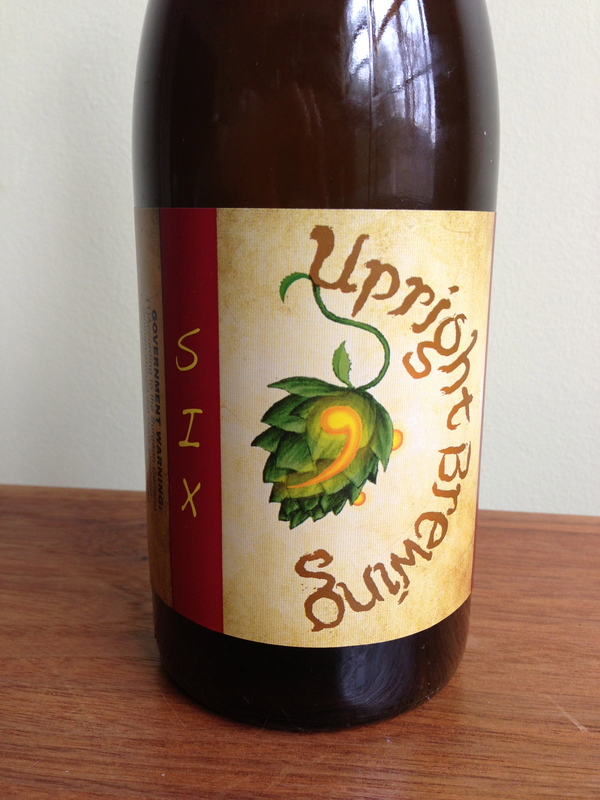 Upright Brewing is all about farmhouse inspired beers using saison yeast and Northwestern ingredients. The beers are numbered based on their starting gravity (pre-fermentation sugar content) in Belgian brewing degrees. The Six displays abundant rye spice characteristics along with some bubble gum derived from open fermentation. It has a dry refreshing finish and me eager to try their other beers. Excellent cider recently acquired at Belmont Station in Portland, OR. 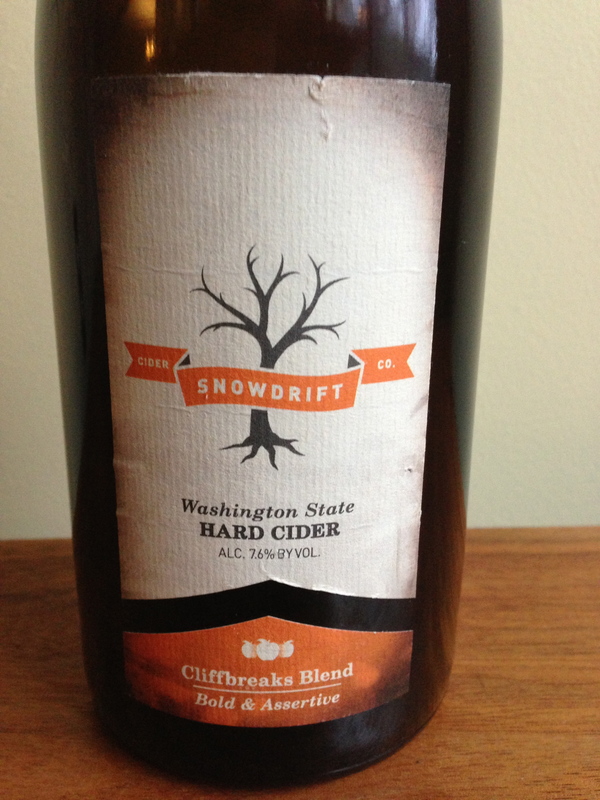 Snowdrift labels themselves a “nano-cidery” having produced 1800 cases last year. Located in the Wenatchee valley in Washington the sunny hot summers and cold winters make an ideal climate for the orchard which grows English, French, and old American apples. An English style cider with nice tannins and a complex taste of apples, melon, and dried fruit. Slightly effervescent. Great with aged cheese. This may be a boozy day. Here’s another cocktail that seems to work well. Add lemon (in our case meyer lemon) simple syrup to a tall glass. Add ice. Add 1/2 a measure of Strega and half a measure of Domaine de Canton. Add a full measure of Hendrick’s Gin. Fill the glass with soda water and add a splash of bitters – in this case I used Fee Brothers’ – Old Fashioned Aromatic Bitters. Blood orange or lemon bitters would work well too. Stir, add a slice of lemon to the rim of the glass and enjoy!